1) What is the Local Pack? The Local Pack is a section of Google’s search results that shows the local business related to your query. 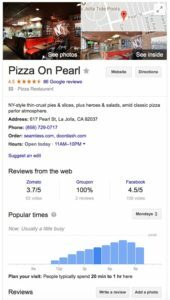 Whenever your query has local intent, Google will show three local businesses that might answer your query. A little while back these local packs were referred to as the 7-pack, as they displayed 7 of the most popular businesses in the area. In keeping up with growing mobile phone usage, Google cut down their 7-Pack down to just three results, along with some changes to the ways the algorithm ranks local results. Now when you search for local businesses, whether on desktop or phone, you will be shown the 3-Pack. Even more recently, Google has started trialing a “paid spot” in their highly coveted 3-Pack. Google’s local 3-pack of organic listings may begin to show ads for certain searches, bringing the number of organic listings down to just 2. People are still debating whether this is the right move on Google’s part. 2) Why Should You Care About The Local Pack? The Local 3-Pack appears in the #1 spot 93% of the time when a local search is performed – and 46% of all searches on Google are of this nature. This means that businesses that are optimized for a Google local search have a better chance of ranking at the top of the search results page, almost every single time. In other words, this is a major advantage for small businesses. According to ThinkWithGoogle, 50% of consumers who conduct a local search on their smartphone visit a store within a day and 18% of those searches lead to a purchase within a day. What’s more, search queries with “near me” in the query have increased 34x since 2011 with the vast majority coming from mobile. So, what does this mean for you? As a small business, you want to come up in local searches as often and as prominently as possible, and the way to do this is by appearing in the local pack. If you are ranked for Google’s holy trinity, your business will reap the benefits. Due to these online benefits, your business will get an increased amount of foot traffic, bringing new customers and increased revenue. 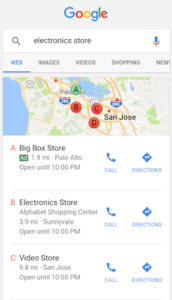 Most people do not go beyond the Google’s first page when searching online, and in a local inquiry, this first page is centered on the 3-Pack. 78% of these local-mobile searches result in offline purchases, which means that every local search query in your area can bring in new customers and revenue. 3) How Can Your Business Rank For The Local Pack? 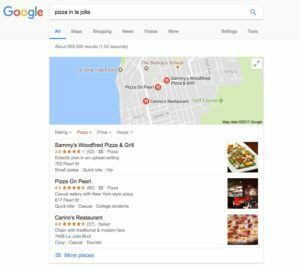 Google’s algorithm takes many factors into account when displaying their Local Pack – for the full rundown of ranking factors, check out Moz’ article. While their algorithm is extremely complicated and mystical, experts point to these three factors as crucial: Business Information, Website SEO, and Online reviews. As website SEO is a complete strategy in itself, we will be taking a closer look at business information and reviews as a way to rank in the Local Pack. Google is always looking to provide the best information and experience to their searchers. As a result, they want to make sure that any business they display in the search results “answers” the searchers query as good as possible. Key factors like proximity, category, and keywords will help them do so. And simply said, Google draws this information from all the Google My Business listings. If you have not set up a Google My Business listing for your small business yet, now is the time to do so (here is the how-to). You are also missing out on all the rewards if you don’t have an optimized listing, so it is crucial that your profile is a 100% complete. We’ve been talking a lot about the importance of reviews for small business recently. There are many benefits to generating reviews, but the one we haven’t mentioned yet is in relation to the Local Pack. Online reviews are a crucial part of the algorithm of the Local Pack and can make or break your chance of taking one of those coveted spots. Google takes into account review quantity, review velocity, review diversity and so on. Specifically Google reviews have a real effect on search rankings, and the listing with the most reviews often comes out as the winner. The listings in the first three-pack have an average of 472% more reviews than the listings in the second three-pack. The top three local listings have more reviews than the next three results, nearly twice as often. 63% of the time, Google’s local three-pack contains the listing with the most reviews. A listing in the top three Google local results has an average of 7.62 reviews, compared to just 1.61 reviews in the second three-pack. Not only do reviews work magic on Google’s algorithm, they also positively influence searchers decision-making process. Keep in mind that consumers who perform local searches are ready to buy and act quickly. Making it in the Local Pack is a tremendous business accomplishment, but it doesn’t end there. You are still competing with two other business in the Local Pack, that are probably similar in terms of product or service. How will the consumer make a decision here? You guessed it, the reviews! If you are the business with the most (positive) reviews, you will most likely beat out your competitors and win over that customer. The Moz study we referred to earlier found that reviews attracted the most clicks. The takeaway? People AND Google love reviews. So once your Google My Business listing is optimized, you need to start raking in those reviews. Up until today, you might have never heard of the Google Local Pack – but you have definitely been exposed it is as a consumer. Now you can implement a Local Pack strategy that will also benefit you as a business owner. With your business listing and online reviews, you have powerful tools at your disposition to make the Local Pack work in your small business’ advantage. Google is about to transform your small business. Previous: Previous post: Progressive Web Apps: The Next Mobile Experience?